I’ve uploaded a new version of the Tamegonit Lodge event patch checklist. It can be found in the Broad Kaw Valley downloads section. The file is a PDF that should allow you to make a mark in the check boxes – the boxes will accept text so you can keep track of your dupes as well. 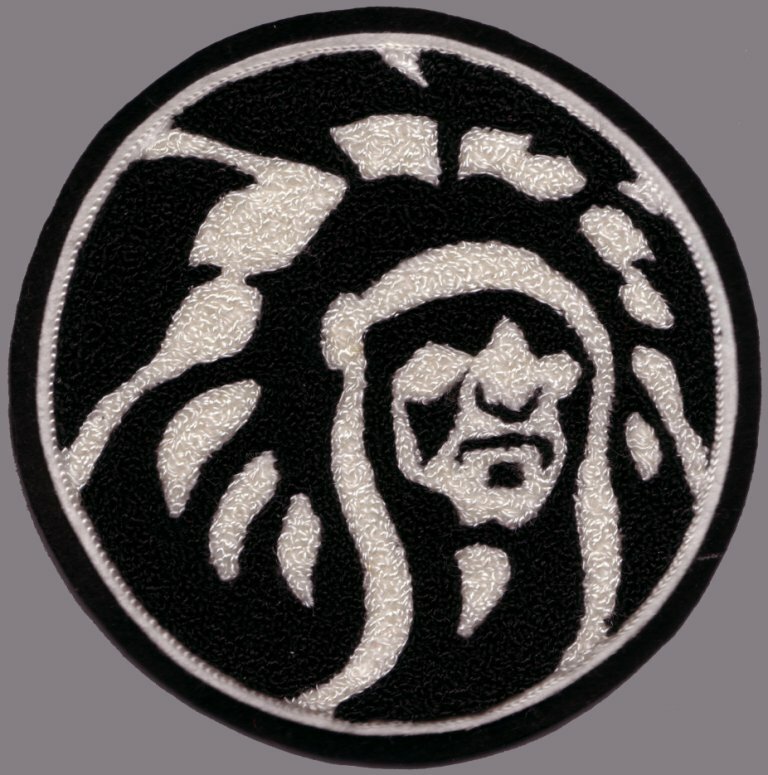 The primary update is the addition of two varieties for the 2004 event patches – as shown below, each patch came in a “curved” and “flat” top. I made some other minor update/clarifications as well. As always, if you have any additions/corrections, please let me know. 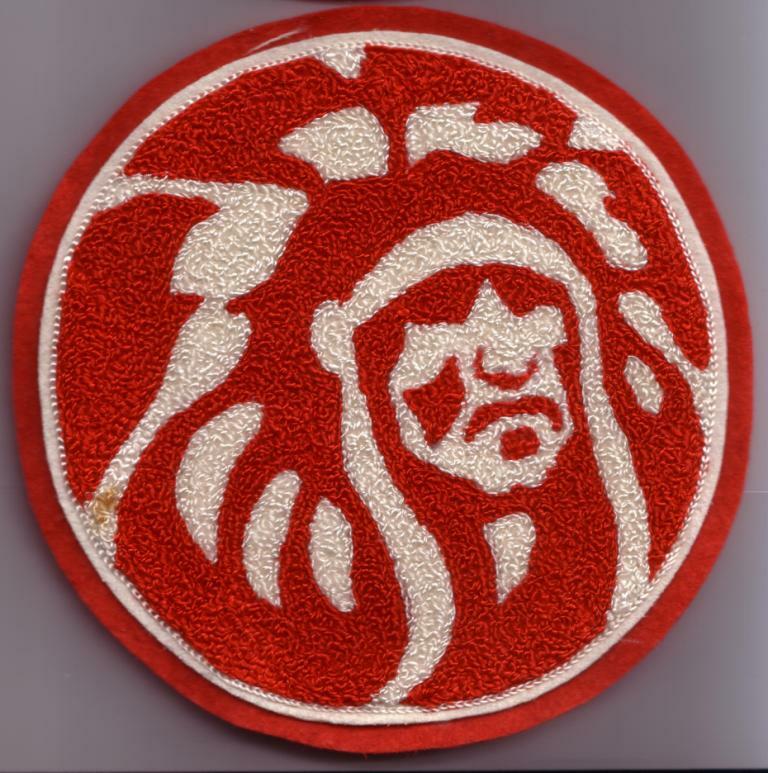 The list includes everything through the end of 2010 (from what I understand no event patches have been made for this year) – except for the belt coup beads that were given out in the late 1980s – see picture below. Examples of the markings on the plastic beads include (which appear to be burned into the bead by hand): “FF” (Fall Fellowship), “SC” (Spring Conclave), “86” (1986), “TN” (Camp Naish), “OA” (Order of the Arrow). The round wooden bead has “SC” written in pen. I didn’t get pictures from all sides, so I can’t catalog these handcrafted treasures just yet. Thanks to Gene T. for the image of the associated backpatch and four “flat” tops. 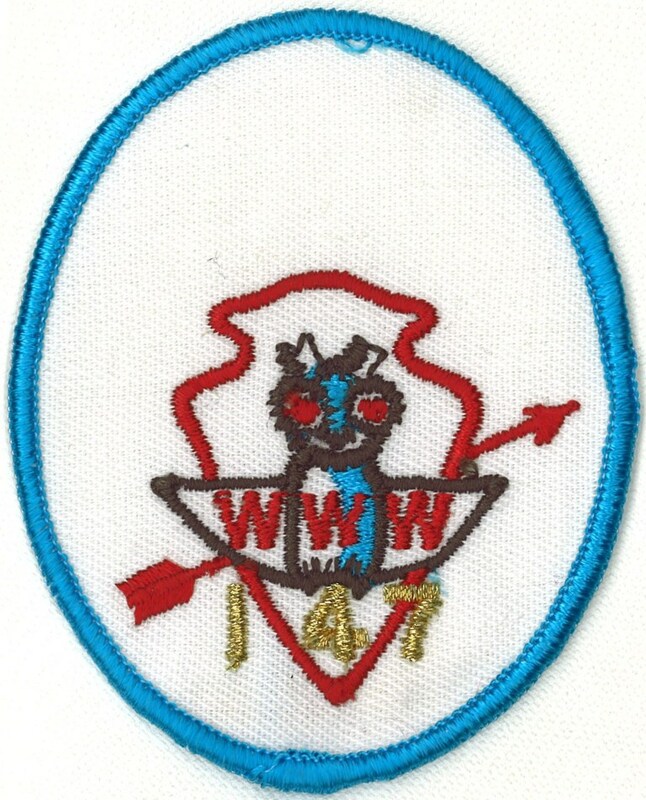 Scanning the patches and making a picture checklist is on my list of things to do…sounds like a good winter project. For you avid Tamegonit Lodge event patch collectors, I just put together a checklist that you may download. The file is a PDF form that will allow you to enter any text or number into the boxes (in case you want to keep track of dupes). Eventually, I plan to create a version that includes a thumbnail image of each patch. If you have any additions/corrections, please feel free to contact me. 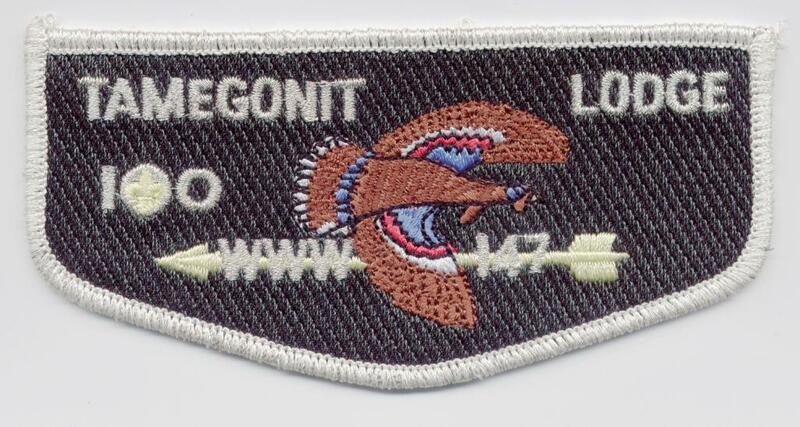 In addition to the Jamboree 2-piece set I posted two weeks ago, Tamegonit Lodge has also issued a 100th anniversary flap. The design is similar to the ubiquitous S-13 and S-45 flaps with the subtle addition of “100th” surrounding the fleur-de-lis. From what I understand, these are available at the Camp Naish trading post, which is generally open on the weekends now that the summer camping season is coming to a close. Thanks to Matt Perryn for the scan! Note: The background color looks almost looks black in the scan, but it is actually dark green. The lodge’s first two odd-shapes (X1 and x2) were issued as part of the Lodge’s 1989 50thAnniversary celebration. The event patches for this year (1989 Spring Conclave, 1989 Fall Fellowship, and 1990 Winter Banquet) combined to form the numeral “50”. The oval- shaped patches were intended to fit in the center of the “0” in the “50”. The X2 was awarded to members of the Lodge who accumulated enough points during the year based on attending different events (national and lodge), attending ceremonies and meetings, or working hours at Camp Naish. The X1 was available for purchase through the trading post as part of a set that included the three event patches. My mom gave me the money to buy this set during Camp Naish family night in the summer of 1990. Thanks, Mom! The X2 below was earned by my dad. Following is a scan of his scorecard. 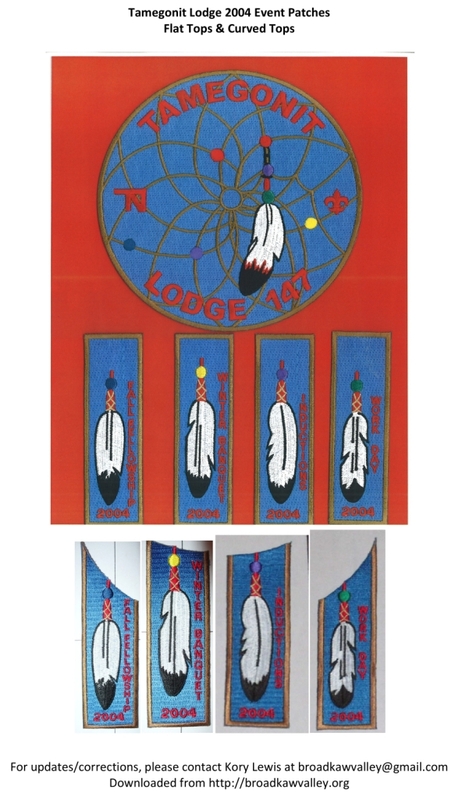 At the conclusion of the Lodge’s 50th Anniversary, the 1990 Winter Banquet, a silent auction was held for the sale of a framed set of the X1 and accompanying event patches. Lodge member Bob Norris won the set for approximately $50 and still has it today. 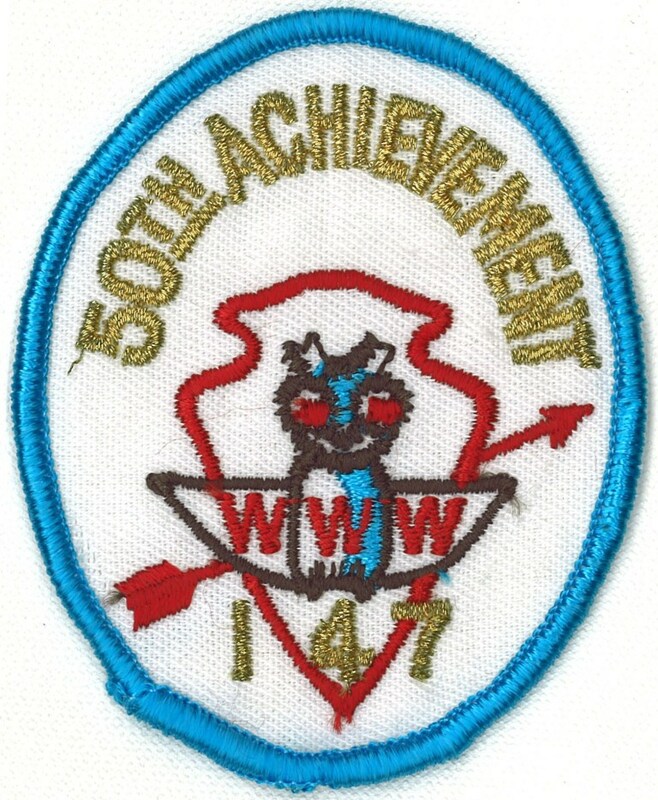 1990, the year I was inducted into Tamegonit Lodge 147, was also the 75th Annivserary of the Order of the Arrow. 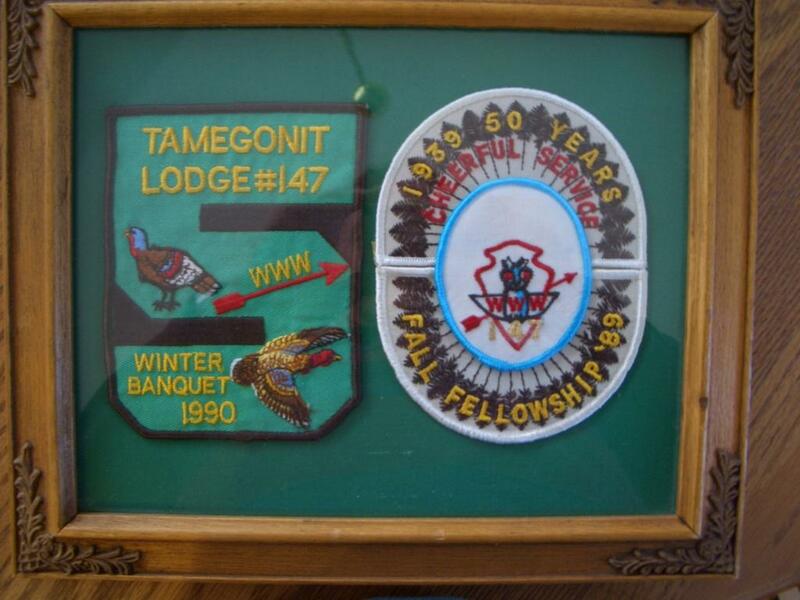 In addition to the flaps for the National Order of the Arrow Conference, Tamegonit Lodge also offered a service flap. 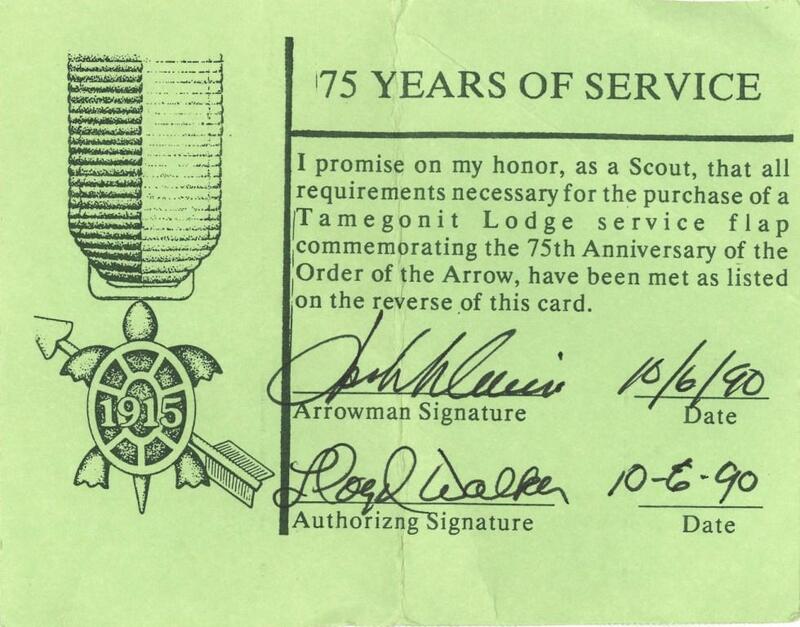 To earn the flap, a lodge member had to complete eight hours of service, fill out a card and have it signed by the lodge chief, camp director, Order of the Arrow coordinator or camp ranger. Below is a scan of the service flap and a card signed by my dad, Jack Lewis, and Camp Ranger Lloyd Walker. When the 1990 8-hour service flaps were delivered, two flaps at approximately the middle of each pouch stated “1990 NOAC” rather than “Service”. I was working in the trading post during Spring Conclave and watched as then-Lodge Chief Tom Sullivan destroyed some of the flaps with a Buck knife. To my knowledge, at least one escaped the knife and is in a collection. Are there more of these out there?